I got tired of replacing the chest-strap-battery in my old Nike monitor so I though it was time to upgrade. Based on the recommendation from a Personal Trainer at my club, I bought this Polar RS200. 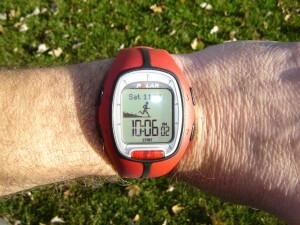 It is the lowest priced Polar monitor he was aware of that you can enter your own HR Zones. I tested it out this morning at my Indoor Cycling class. What impressed me the most is the new chest strap design, very comfortable! No more hard plastic strap cutting into my chest.